This topic deals with costs and profit maximization under competition. The treatment of this topic on the Atlas follows almost precisely that in Chapter 9, Costs and Profit Maximization Under Competition, and Chapter 10, Competition and the Invisible Hand, of the open access Principles of Microeconomics course offered by Tyler Cowen and Alex Tabarrok at the Marginal Revolution University online education platform (http://www.mruniversity.com/courses/principles-economics-microeconomics, accessed 7 May 2016). Appropriately utilize and interpret results of applying the principles of producer theory and competition, including the identified core concepts, to the analysis of public policy and management problems. We believe that this topic and its core concepts can be mastered to the MPP/MPA level by watching and re-watching the 72 minutes of MRU course videos listed below and doing the 43 sample questions associated with these video segments and reproduced at the bottom of this page and repeated on the appropriate concept pages. Atlas pages: Competition and Theory of the Firm and associated Concepts. Alex Tabarrok, Introduction to the Competitive Firm (7-minute video), Principles of Economics – Microeconomics, Marginal Revolution University, at http://www.mruniversity.com/courses/principles-economics-microeconomics/deeper-look-tradeable-allowances, accessed 6 May 2016. Alex Tabarrok, Maximizing Profit under Competition (13-minute video), Principles of Economics – Microeconomics, Marginal Revolution University, at http://www.mruniversity.com/courses/principles-economics-microeconomics/deeper-look-tradeable-allowances, accessed 6 May 2016. Alex Tabarrok, Maximizing Profit and the Average Cost Curve (12-minute video), Principles of Economics – Microeconomics, Marginal Revolution University, at http://www.mruniversity.com/courses/principles-economics-microeconomics/profit-maximization-average-cost, accessed 6 May 2016. Alex Tabarrok, Entry, Exit, and Supply Curves: Increasing Costs (7-minute video), Principles of Economics – Microeconomics, Marginal Revolution University, at http://www.mruniversity.com/courses/principles-economics-microeconomics/profit-maximization-average-cost, accessed 7 May 2016. Alex Tabarrok, Entry, Exit, and Supply Curves: Constant Costs (10-minute video), Principles of Economics – Microeconomics, Marginal Revolution University, at http://www.mruniversity.com/courses/principles-economics-microeconomics/supply-curve-constant-cost-industry, accessed 7 May 2016. Alex Tabarrok, Entry, Exit, and Supply Curves: Decreasing Costs (6-minute video), Principles of Economics – Microeconomics, Marginal Revolution University, at http://www.mruniversity.com/courses/principles-economics-microeconomics/supply-curve-decreasing-cost-industry, accessed 7 May 2016. Alex Tabarrok, Minimization of Total Industry Costs of Production (9-minute video), Principles of Economics – Microeconomics, Marginal Revolution University, at http://www.mruniversity.com/courses/principles-economics-microeconomics/minimizing-industry-costs-production-invisible-hand, accessed 7 May 2016. Alex Tabarrok, The Balance of Industries and Creative Destruction (8-minute video), Principles of Economics – Microeconomics, Marginal Revolution University, at http://www.mruniversity.com/courses/principles-economics-microeconomics/creative-destruction-definition-elimination-principle, accessed 7 May 2016. From http://www.mruniversity.com/node/230468, http://www.mruniversity.com/node/230512, http://www.mruniversity.com/node/264181, http://www.mruniversity.com/node/264285, http://www.mruniversity.com/node/264309, http://www.mruniversity.com/node/267267, accessed 3 May 2016. AQ102.08.02. A competitive market has which of the following characteristics? Just below the world price. Just above the world price. At a price dependent on the quantity chosen. AQ102.08.04. On January 27, 2011, the price of Ford Motor Company stock hit an almost 10-year high at $18.79 per share. (Two years prior, in January 2009, Ford stock was trading for about a tenth of that price.) Suppose that on January 27, 2011, you owned 10,000 shares of Ford stock (a small fraction of the almost 3.8 billion shares). Suppose you offered to sell your stock for $18.85 per share, just slightly above the market price. How many shares would you sell? AQ102.08.05. Suppose instead that on January 27, 2011, you wanted to sell your 10,000 shares of Ford stock but you reduced your asking price to $18.75 per share? How many shares would you sell? AQ102.08.06. Given your answer to the previous question, should you sell your shares at $18.75? AQ102.08.07. Which characteristic below best describes the demand curve that you as an individual seller of Ford stock face? AQ102.08.09. Whenever money is used to purchase capital, interest costs are incurred. Sometimes those costs are explicit—like when Alex borrowed the money from the bank—and sometimes those costs are implicit— like when Tyler had to forgo the interest he could have earned had he left his funds in a savings account. If an economist and accountant calculated Alex and Tyler’s costs, for whom would they have identical numbers and for whom would the numbers differ? Economist and accountant would agree on Alex’s costs and disagree on Tyler’s. Economist and accountant would agree on Tyler’s costs and disagree on Alex’s. AQ102.08.10. 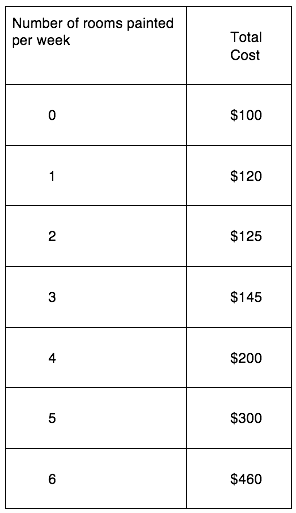 In the aforementioned disagreement on cost of one of the activities, which profession would calculate a larger cost? AQ102.08.11. Which type of cost is dependent on the amount of quantity produced by a firm? AQ102.08.13. True or False: When a competitive firm maximizes profit, profits are always greater than 0. AQ102.08.14. Paulette, Camille, and Hortense each own wineries in France. They produce inexpensive, mass-market wines. Over the last few years, such wines sold for 7 euros per bottle; but with a global recession, the price has fallen to 5 euros per bottle. Given the information below, let’s find out which of these three winemakers (if any) should shut down temporarily until times get better. Remember: Whether or not they shut down, they still have to keep paying fixed costs for at least some time (that’s what makes them “fixed”). To keep things simple, let’s assume that each winemaker has calculated the optimal quantity to produce if they decide to stay in business; your job is simply to figure out if she should produce that amount or just shut down. Which of these women, if any, earned a profit? AQ102.08.15. Who should stay in business in the short run? AQ102.08.17. Fill in the blank: Even if profit is negative, if revenues are ______ variable costs, then it’s best to stay open in the short run. AQ102.08.18. You’ve been hired as a management consultant to WaffleCo, a maker of generic-brand frozen waffles. They’re each trying to figure out if they should produce a little more output or a little bit less in order to maximize their profits. The firms all have typical marginal cost curves: They rise as the firm produces more. Your staff did all the hard work for you of figuring out the price of the firm’s output is $4 per box and the marginal cost of producing one more unit of output is $2 per box at its current level of output. However, they forgot to collect data on how much the firm is actually producing at the moment. Fortunately, that doesn’t matter. In your final report, you need to decide if the firm should produce more, less, or stay at the current output level. What do you recommend? AQ102.08.20. Given the cost function for Simon, a housepainter in a competitive local market, below, answer the questions that follow. (You may want to calculate average cost.) What is the minimum price per room at which Simon would be earning positive economic profit? AQ102.08.21. What is the least common cost structure for an industry? AQ102.08.23.1 It’s more costly to grow incense in Eastern Africa than in Arabia Felix. Which region would you expect to see more incense grown in? AQ102.08.24. In the competitive children’s pajama industry, a new government safety regulation raises the average cost of children’s pajamas by $2 per pair. If this is a constant cost industry, then in the long run, what exactly happens to the price of children’s pajamas? AQ102.08.27. At this point in the story, what sort of cost industry (constant, increasing, or decreasing) would you consider doughnut shops owned by Cambodians to be? AQ102.08.28. Fast forward 40 years: What kind of cost structure are Californian doughnut shops probably in now? AQ102.08.29. We mentioned that carpet manufacturing looks like a decreasing cost industry. In American homes, carpets are much less popular than they were in the 1960s and 1970s, when “wall-to-wall carpeting” was fashionable in homes. Suppose that carpeting became even less popular than it is today: What would this fall in demand probably do to the price of carpet in the long run? AQ102.08.30. Entrepreneurs shift capital and labor across industries in pursuit of profit. Let’s look at this a little more closely. Suppose there are two industries: a high-profit industry, Industry H, and a low-profit industry, Industry L. Answer the questions below about these two industries. If the two industries have similar costs, then what must be true about prices in the two industries? AQ102.08.31. Suppose instead that the prices in the two industries were identical. In this case, what must be true about the costs in the two industries? AQ102.08.32. Assuming that prices in the two industries were identical, if labor and capital are moved from Industry L to Industry H, are more units of output lost in Industry L or gained in Industry H? AQ102.08.33. Suppose that two industries, the pizza industry and the calzone industry, are equally risky, but rates of return on capital investments are 5% in the pizza industry and 8% in the calzone industry. Which way will capital flow—from the pizza industry to the calzone industry, or from the calzone industry to the pizza industry? AQ102.08.34. We’ve claimed that the efficient way to spread out work across firms in the same industry is to set the marginal cost of production to be the same across firms. Let’s see if this works in an example. Consider a competitive market for rolled steel (measured by the ton) with just two firms: SmallCo and BigCo. If we wanted to be more realistic, we could say there were 100 firms like SmallCo and 100 firms like BigCo, but that would just make the math harder without generating any insight. (We’ll also ignore fixed costs of starting up the firms just to make things a little simpler. ) 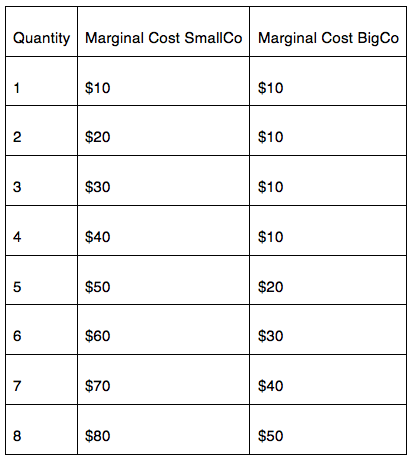 The two firms have marginal cost schedules like this: What is the total cost of SmallCo producing 6 units of output? AQ102.08.35. What is the total cost of BigCo producing 6 units of output? AQ102.08.36. What would the price have to be in this competitive market for these two firms to produce a total of 11 tons of steel? AQ102.08.37. What would the total cost be if BigCo were the only firm in the market, and it had to produce 7 tons of rolled steel? AQ102.08.38. What would total cost be if SmallCo and BigCo let the invisible hand divvy up the work between them to produce 7 tons of rolled steel? AQ102.08.39. Would it make sense to shut down the more inefficient of the two firms? AQ102.08.40. Let’s review the basic mechanism of the elimination principle with the following questions. When demand rises in Industry X, what happens to profits? Do they rise, fall, or remain unchanged? AQ102.08.41. When that happens, do firms, workers, and capital tend to enter Industry X, or do they tend to leave? AQ102.08.42. Does this tend to increase short-run supply in Industry X or reduce it? AQ102.08.43. In the long run, after this rise in demand, what will profits typically be in Industry X? Image: Minute 11:39 of MRU Video, at http://www.mruniversity.com/courses/principles-economics-microeconomics/profit-maximization-marginal-cost-marginal-revenue, accessed 3 May 2016.